Whether you are celebrating your Childs Christening, Baptism, Naming Ceremony or Confirmation, it is a perfect occasion to bring family & friends together and our Function Room is an ideal venue for this. 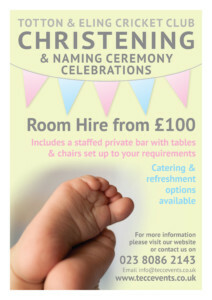 Room Hire for a Sunday Christening is £100 for up to 4 hours. Access to the room is available from 11:00am on the day to set up or decorate the room if required. Room hire includes a staffed, private bar and standard tables & chairs to accommodate your guests. We offer professional Catering to meet your budget and requirements. If you would prefer to do your own catering in the form of a Cold Buffet, we offer an ‘Own Catering’ agreement. You are able to bring in your own room decorations to suit your celebration. However, we do have a large selection of room decorations for you to hire if required, from white table linen to tea lights & holders, please ask for details. We also offer the hire of a small PA System for you to play soft background music during the celebration, please ask for details. We have a Private Children’s Playground (for under 10 yrs) located in the grounds of the Club for your guests children to use.